Over the years, BMW has manufactured a number of amazing vehicles and cemented its brand as one of the best in the automobile market. If you are looking for an economical and full of comfort city car or you live at a crowded place, 2014 BMW i3 having absolutely zero-emission is just the perfect car for you. Experts believe that this model would be a massive hit in crowded cities like Tokyo, Amsterdam, New York, London, etc. 2014 BMW i3’s drive is quite smooth and well-controlled; however, it is not that soft due to the stiffer sidewalls of the narrow and tall tires. In comparison with other electric cars in the market, the i3 offers an amazing driving experience with automatic transmission and regenerative braking, which allows one-pedal driving. On the road, the i3 is very crisp, with a tight turning circle of 32.3 feet and nimble handling. Despite the fact that it is ideally suited for driving in the city, the i3 runs quite well on the highway as well. 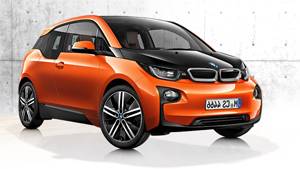 BMW i3 possesses a smooth continuous torque from takeoff, like most battery-cars. From 0 to 60 miles per hour, the 2014 i3 will accelerate in about 7 seconds. It takes 3.5 seconds to accelerate from 0 to 35 miles per hour. The top speed is 93 miles per hour, which is very good for a small electric car. It is priced at $41,350 in the US and £25,680 in the UK. 2014 BMW i3 is a remarkably efficient electric car when it runs on grid power, which it is expected to do for a lot more than half of its miles. The built-in charger is capable of up to 7.4 kilowatts, which is greater than some of its competitors like Nissan Leaf and some other electric cars, as they offer 6.6 kilowatts. The charger can charge 80 percent of the battery or more in less than four hours. On top of that, users can get their cars recharged from public charging stations as well. One has to admit that the exterior of 2014 BMW i3 is not quite up to the mark as the straight lines and curves at the rear looks a bit confusing. However, it is very elegant from the front three quarters and side views. A brilliant profile of the tall shape, the snub nose and the car’s wide stance offer a very solid look. When the car is shown with its front wheels cocked, the narrow tires can be a little disconcerting. There are no question marks about the car’s interior though as it feels like a loft living room. Controlled through the iDrive knob on the console, the 10.2-inch display screen presents an amazing picture at the top surface of the dashboard. On top of that, there is a smaller screen behind the steering wheel. Interior panels are made of kenaf. All in all, the interior is simple but elegant. Some of the top competitors of 2014 BMW i3 are Nissan Leaf, Chevrolet Volt, Fiat 500E and Ford Focus Electric. However, the i3 possesses superior features for a city car and is expected to gain a lot of popularity with the passage of time. The 2014 BMW i3 is surely one of the best electric cars in the market, which is likely to pose a major threat to its competitors. I would give it 9 out of 10.